A recent addition to the Connecticut Soldiers Collection at the Dodd Center are the Raymond E. Hagedorn Papers. Chronicling the training and war service of Major Raymond E. Hagedorn of Manchester, Connecticut, the papers will be of great interest to scholars and the public at large. Describing in vivid detail his training prior to the attack on Pearl Harbor, and his service in the South Pacific, the Hagedorn Papers provide an invaluable account of America’s preparation for war and life in the Army. From Camp Blanding, Florida to Guadalcanal, and back to Manchester, the letters between Hagedorn and his family and friends provide one family’s perspective on the Second World War. From the quality and quantity of the food, and his constant battle to stave off boredom, Hagedorn brings life in the army and the war to life. Through detailed descriptions of army victuals, island life, his health, and his wife Gertrude’s descriptions of life at home, the Hagedorn Papers illustrate the sacrifices made by Americans at home and abroad. Exposing the reality and quotidian nature of war, the Hagedorn Papers will be an invaluable source for anyone interested in daily life during World War Two. Providing often humorous details about the environments he encounters, including squawking birds, swarms of mosquitos, the variety of fruit available, and the activities of the native populations, Hagedorn’s letters confirm the military axiom that war is ninety-nine percent boredom and one percent sheer terror. An officer in the Army’s 43rd Infantry Division, Hagedorn traveled from San Francisco to New Zealand, New Caledonia, and Guadalcanal between October 1942 and April 1943 before being diagnosed with low blood pressure and a nervous disorder. 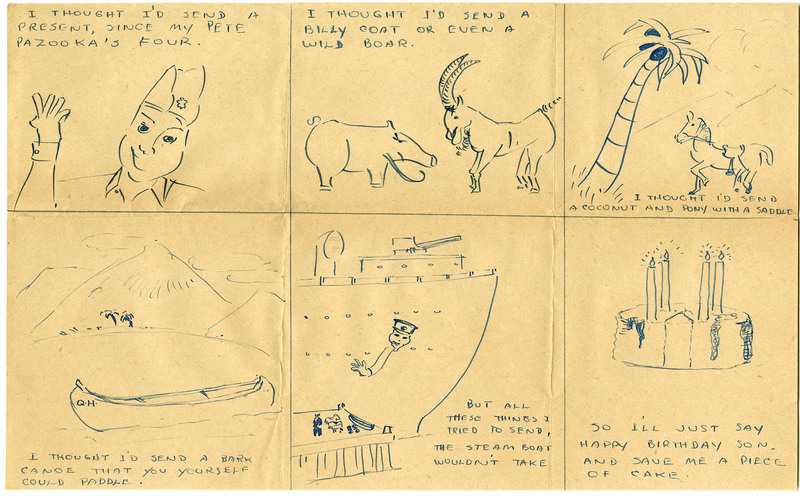 Focusing on his declining health, and the activities he engages in to stay busy, Hagedorn’s letters lose much of their early humor and by March 1943 take on a much more serious tone. Evacuated to the United States in April 1943, Hagedorn describes life at military hospitals in and outside of the United States and the process of medical retirement from the Army, providing a wealth of information on an often overlooked aspect of war. Plagued by poor health, and the effects of the South Pacific’s tropical climate, Hagedorn’s letters present one soldier’s ongoing struggle to remain patriotic in the eyes of the army while also maintaining his health and well-being for his family. Retired from active duty in May 1944 Hagedorn remained in the Connecticut National Guard following the war and was eventually promoted to Lieutenant Colonel. During the Korean War, Hagedorn served as an intelligence officer and aide to Connecticut’s Adjutant General. Briefly resuming his electrical business after the war, Hagedorn went on to become the plant engineer for the New Departure Division of General Motors in Meriden, Connecticut. Retiring in 1962 Raymond Hagedorn spent the rest of his life in Manchester, until passing away on September 21, 1985.